As it's the 31st of October, this will be my final post for the third annual Vegan Mofo: Vegan Month of Food. Today also happens to be Halloween, and I'm obviously not a sculptor. 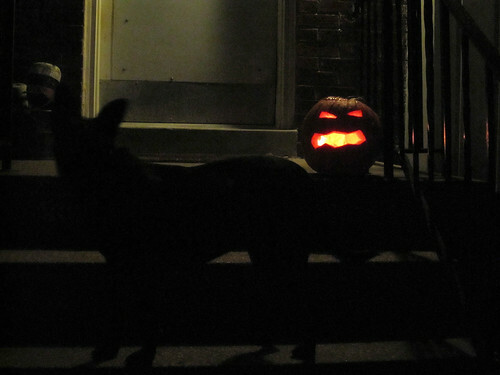 But a pumpkin makes for good eating, uncarved. 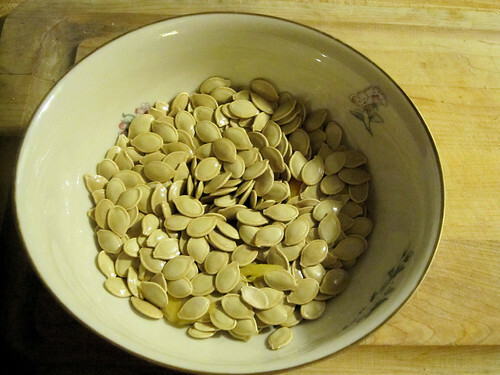 For me, maybe the best part of the pumpkin is the seeds. Remove the stringy strands, and rinse the seeds under fresh water. Drain and allow to dry. Toss the seeds with a teaspoon or so of olive oil, a dash of Kosher salt, a small grind of black pepper, and a 'scary' dash each of garlic and cayenne powder. At 350 °F, bake the seeds for 20 minutes. Increase the temperature to 425 °F and cook for 5 more minutes, until the seeds only begin to brown...no more! Remove and cool. Add additional salt or seasoning, if needed, to taste.Allow to cool. Scoop out the 'meat' from the inside of the pumpkin. Clean and cube. Steam in 10 ounces of light lager (NOT an IPA or other hoppy beer) for 20 minutes. Purée the pumpkin and place aside. Sauté a few tablespoons of tomato paste in olive oil over medium heat until fragrant. Lower heat slightly and add diced onions, diced green peppers, and chopped garlic. Spice with cumin, paprika, s/p, to taste. Add remaining 2 ounces of light lager of beer, if needed, to prevent scorching. Cook until onions are translucent. 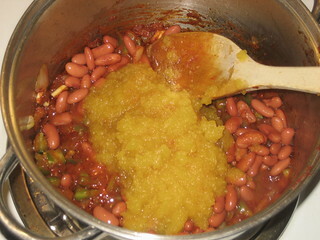 Add the pumpkin to the sauté, along with some cooked canned red beans. Reduce heat to low and cook for a few more minutes. Sprinkle with some paprika when plated. Photos: here. Roast the cubed gourd as you would small 'new' potatoes. Bake a vegan pumpkin pie. Final step: pour the final Oktoberfest lager beer of the year. Winter brews are a-comin'. Want more VeganMoFo? Check out these photos on Flickr. I met up with Brewer Bill Madden at the Northern Virginia Fall Brewfest. I asked him about progress on his soon to be built brewpub, Mad Fox Brewing Company. Most of the equipment has been sourced: in addition to a 15-barrel brewhouse,there will be several 30-barrel fermenters, double jacketed so that both 15-barrel and 30-barrel batches can be brewed. Serving tanks will be sized at 15 bbl to allow batches to be split in two to help ensure freshness. To afford him flexibility in serving different beers, Bill is purchasing a large volume of kegs. If a tank is needed to ferment or serve a beer, Bill can simply rack the remaining finished beer into the kegs. He'll need to do that, because he plans to have at least 12 beers on tap at any given time. 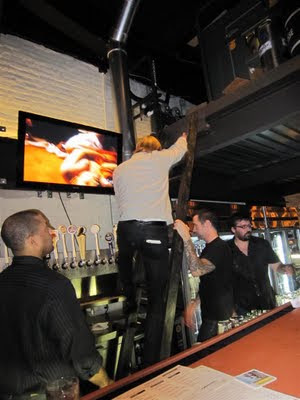 Bill plans to have 5 cask ales tapped at any one time, using a set-up somewhat similar to that at Churchkey (beer bar in Washington, DC) ... except of course, the beer will be made fresh at the brewery. Firkins will rest in refrigerated units under the bar, the temperature set in the low to mid 50s, traditional English cellar temperature. A row of beer engines will sit above, used to handpump the beer to the bar. Bill is currently working on the paperwork and planning details, one ear to the phone, two hands on the laptop. Construction begins in January 2010, and Bill says he can't wait. Many thirsty northern Virginia good beer fans would agree. The term' brewhouse' refers to the kit of vessels on the 'hot' side of the brewery, i.e., used to brew the beer: mash tun, lauter tun, kettle, whirlpool, wort chiller, hot and cold liquor (water) tanks. Vessels are often designed to combine several of these functions. The fermenters and serving tanks comprise the 'cold' side of the brewery. A barrel doesn't exist as an actual container. It's a measure of volume: 31 gallons. More on beer volumes here. A firkin is the name given to one particular size of cask: 9 UK gallons, which is the equivalent of 10.8 US gallons. More on cask volumes here. The photo of Bill Madden is reprinted above courtesy of local beer maven Chuck Triplett. Prior stories on Mad Fox here and here and here and here. My #FollowFriday is @beersage. Not just because his Tweets reinforce his chock-full-of-beer-news blog. But because it's his birthday. Bar etiquette: Why, when the bartender places a bevnap under your pint of beer, doesn't she place one under the glass of water? Eric Asimov, at his wine blog The Pour at the New York Times, has written a gorgeous plea for beer and wine to find common ground. Forgive me if I quote him at length. Beer and wine are not in competition. Yet people in the wine business, who I assure you drink an awful lot of beer, don’t often take it seriously as a beverage. And people in the beer business, perhaps in reaction to not-so-imaginary slights, rarely even acknowledge the existence of wine, much less deem it worthy of drinking. <...> The enemy of beer is not wine and the enemy of wine is not beer, just as the enemy of bread is not fruit and vice versa. But the enemy of good beer and good wine, and good food in general, is bad beer, bad wine and, yes, bad food. The enemy of good wine is the atrocious marketing that makes wine an aspirational commodity, just another luxury good to purchase for its status value. There's more and more of this aspirational avarice and antagonism in the 'craft' beer world these days. Beer vs. wine; IPAs vs pale ales; ales vs. lagers; imperial whatevers vs. sesson beers; taste vs. alcohol content; the newest vs. the good. That's too bad. Such one-upmanship misses the point and the fun. It's the flavor, and the company in which you enjoy the beer, which should be the pleasure. It was a rough day, Saturday in northern Virginia, to hold a beer festival: torrential rains, temperatures that began in the 60s and quickly dipped, and strong gusts of wind. Tents threatened to blow over and mud was ankle deep, but nearly 900 souls braved the conditions and enjoyed the beers at the Northern Virginia Fall Brewfest. To cover losses in case of rain, the organizers had taken out 'rain insurance' several months earlier: 10% of estimated expenses. Good thing! Expected attendance had been 6,000. The storm front moved out at 6pm, Saturday. On Sunday morning, Bill Madden of Mad Fox schlepped in several bales of straw to cover the mud behind the table for his volunteers, and to provide a less mucky footpath to the tent. Taking his cue, I purchased bales of straw at nearby church's pumpkin patch. Bull Run Park wardens initially were aghast at the straw cover, but by the early afternoon had seen the utility of protecting what remained of the turf, and acquiesced. The caskman frowned. There was no cask ale. Caveat lector: I work for a wine/beer wholesaler in northern Virginia that distributes Flying Dog, Allagash, and Clipper City, among others. In fact, that's why I was there at the festival, also bringing beers from Otter Creek, The Raven, and Gaffel. Sloganeering to the 'nth' degree: a 'tricked-out' Corolla. I wonder how many, under a certain age, recognize the yellow symbol just to the left of the Toyota ornament in the upper center? Birch & Barley/Churchkey Beer Manager Greg Engert climbs a ladder behind the bar at Churchkey, to gain access to the three refrigerated keg rooms located on a balcony over the pub. Birch & Barley/Churchkey, Washington DC's newest beer bar and restaurant, opened its doors at 5:45 Thursday afternoon. The line to get in snaked around a couple of city blocks, at 14th St. and Rhode Island Avenue, NW. Your friendly neighborhood caskman was there to enjoy the beers (500 different bottles 50 different draughts, 5 cask ales), and was impressed into volunteer cask service. Gladly! Olah Dubh: a dark ale from Harveistoun Brewery in Scotland, called Old Engine Oil, that has been aged —before being cask-conditioned— in casks of 40 year old Highland Park Scotch Whisky. Physically impressive, the restaurant —floor level Birch & Barley, seating 90, with a few seats at the bar, and the less formal upstairs beer bar Churchkey (130 capacity) — makes a strong beer statement for Washington, D.C. In Birch and Barley, the downstairs dining room: Copper tubing house beer lines carrying 50 beer draught lines beer from two stories up, looking very much like the pipes of a church organ. Earlier YFGF.com stories here and here and here. We are opening today Thursday, 22 October]: at 5 pm in Churchkey, and at 6 pm in Birch & Barley. We are all excited, and cautiously optimistic. Washington DC 'food' blogger Metrocurean has a pre-opening write-up at her site, with photos. According to Metrocurean, the main restaurant —downstairs at Birch & Barley— will feature Chef Kyle Bailey's modern American menu. The upstairs beer bar —Churchkey— will feature four sections: Fresh, Pressed, Roasted, and Fried. And the beers? Available upstairs and down, a rotating list of 500 bottles, 50 drafts, and 5 cask-conditioned ales. 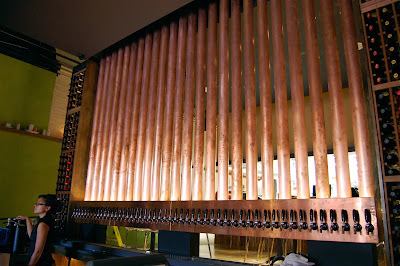 The drafts are served via an impressive manifold of outer-lined copper pipes, that has already been nicknamed the 'beer organ,' after the majestic musical instrument it resembles. UPDATE: Story and photos from opening night here. Why the name 'Churchkey' for a beer pub? Rob Kasper at the Baltimore Sun tells us what a churchkey is, here. 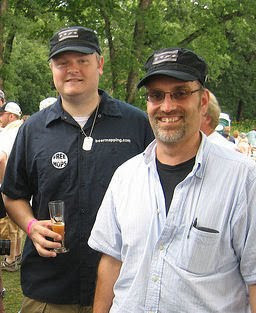 Mike Dolan and Andrew Nations write the Washington, DC area beer blog DC Beer.com. They have initiated a series of interviews they call "Have a beer with ...". One might argue that the main contributing factor to the ever-growing beer culture in DC is not the beer itself, but rather the people behind it. The brew masters, bartenders, beer geeks and distributors promote the scene, and in many ways, are responsible for the great selection DC has to offer. Have a beer with… is a new feature in which we spotlight individuals who play a significant role in promoting the DC beer scene in one way or another. Since I merely report the beer news that intrigues me (and editorialize on it), I'm honored that they chose me as their first subject. I look forward to reading the upcoming interviews with the beer makers, beer movers, and beer shakers —known, and those who should be better known— in the Washington, D.C. area. If you wish, you can read my interview here. I didn't embarrass myself ... too badly. DC Beer.com is the beer blog. 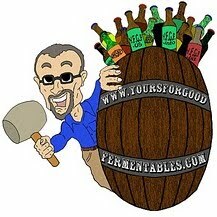 DC-Beer is a wholly separate subscription e-forum of beer lovers in the Washington, DC area. Such lists are ultimately subjective, but the editors at Men's Journal seemed to have done their homework. The reasons they gave for their choices are sound, if not wholly convincing. Beer Culture: Within an 80-mile radius of the city center, Stoudt’s, Victory, and Sly Fox breweries cook up creatively hopped pilsners and experimental pale ales that are pushing the limits of these traditionally mild styles. Yet the editors failed to mention the spectacular Philly Beer Week, the first of its kind in the nation, and arguably the best. After spending a few days in San Diego this summer -- and, more recently, watching so many of the area's brewers rake in medals at the Great American Beer Fest -- I can't argue with that city's No. 1 ranking. Whether you're hitting one of the 30-plus breweries in the area (including the amazing Stone and Green Flash) or enjoying a pint at Toronado or Hamilton's, it's just a wonderful place to drink beer. There are places in Houston with as many tap handles, but these San Diego bars are primarily populated with locally brewed beers. It's a different experience. The renaissance in the US of good beer includes an amazing cornucopia of imported beers. This is the spice, if you will, to the local choices. Beer, however, is a fragile, perishable foodstuff. It shows best closest to its source. Putting aside the issues of local provenance and civic pride, a city that recognizes and embraces that fact will have a more vibrant beer culture. In a recent post, beer blog BeltwayBeer.com published the draft list at an influential Washington, D.C. area beer bar/restaurant. Of its 28 taps, 16 are US craft, 11 are imports (German, Czech, and Belgian), and one is an English cider. It's an amazing list, even honoring the granddaddy of all craft beers: Anchor Steam. But where's the local?? The list features only one beer from all of the breweries in the local tri-state area of Washington D.C., Maryland, and Virginia. Not to single out this particular establishment, but a lack of local taps is indeed city-wide. Baltimore, Maryland officially falls in this Washington, D.C. conurbation, but it's miles ahead in terms of loyalty to local beers. Day to day, Maryland breweries are well-represented. Even during the recently completed Baltimore Beer Week, when many far-afield breweries were featured, the underlying murmur was "Ain't Bawlmer grand, hon?" —and by extension, Maryland. Here in D.C., long-awaited Birch and Barley/Churchkey (not the bar mentioned above) will open this Thursday, adding what promises to be a stellar showcase for good beer to a burgeoning list of beer bars and restaurants already in the city. Such places comprise one important peg in building a beer culture. Loyalty, however, is not slavish support. It is informed, active, two-way engagement. When was the last time you were able to pick up the phone, call Belgium, and talk with Carlos Brito, CEO of international conglomerate Anheuser-Busch InBev, to complain about the weirdly unpleasant taste of, say, Bud Lite Golden Wheat? You could have, however, telephoned one of our several local breweries, and talked personally with the brewer or owner with praise or constructive criticism. I'll stipulate that the craft brewery roster in the Washington, D.C. area may not be as experimental as that in the San Diego area (and the weather not as spectacular), but it's not for lack of good breweries that we're not going to be in that top 5 tier of beer cities. Consider the run on medals and awards by DC/MD/VA breweries at the 2009 Great American Beer Festival. It's in terms of loyalty to and support of local beer that Washington, D.C. beer culture falls short. I'm not chastising too much, though. With beer choices like these, the 10th, or 12th, or 15th spot ain't bad. Caveat lector: I work for a northern Virginia beer/wine wholesaler which sells beer from local breweries Flying Dog and Clipper City. 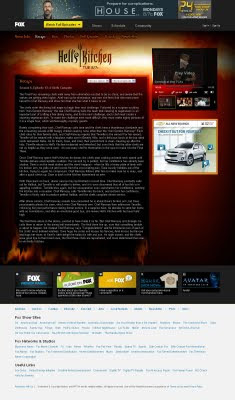 Well reasoned and researched look at the Monster vs. Vermonster imbroglio, at A Good Beer Blog: http://bit.ly/4kXGrt. My #FollowFriday today on Twitter is Rachel Maddow @maddow. Because sometimes it's not just about the beer. Thoughtful political thinking. Okay, I can't resist any longer. It's the only appropriate lede. Saturday's cold autumn rain did nothing to 'chill' or 'dampen' the ardor of five hundred thirsty cask ale fanatics, who descended enthusiastically upon the Pratt Street Alehouse in Baltimore, Maryland, for the 6th annual Chesapeake Real Ale Festival, organized by the only US branch of the UK-based Society for the Preservation of Beer From the Wood (SPBW), as part of Baltimore's observance of its first ever Baltimore Beer Week. There you have it: in one sentence, sixty-nine words, the obligatory who-what-where-when-and-why, and two bad puns. I was asked several times, "What's the best cask, what's the star of the show?" My answer? There were a few casks that were not as well-conditioned as they could have been, but whenever there are 40 or so fresh cask ales available in one place at one time (and two kellerbiers, or cask lagers), I'm not choosing between them. There were several brewers and representatives from their breweries onsite with their beers. It's no knock against the volunteer pourers, but one wants to be able to talk shop with the brewers. I saw Hugh Sisson, Stephen Marsh, and Kurt Krol from Clipper City; Jim Lutz from Flying Dog; Volker Stewart, Rob Perry, and Steve Frasier from The Brewer's Art; Tom Flores and Maggie Lenz of Brewer's Alley; Charles Noll from Franklin's; John Franz from Lancaster; Steve Jones, of course, from Pratt Street Alehouse; Geoff Lively from Rock Bottom, Bethesda; Mike McDonald from White Marsh Brewing; and Chris Hancq from Yards Brewing. In attendance, but without a cask, was Rich Fleischer of Hook and Ladder Brewing. He expressed confidence that his long-awaited pub will indeed be opening in 2010 in Silver Spring, Maryland. Going into an old firehouse, the project has dealt with various structural and building code issues. Other beer notables included Alan Moore (president of the SPBW, and organizer of the Real Ale Fest); Joe Gold (past president of the SPBW, and founder of Baltimore Beer Week); Rob Kasper (Baltimore Sun features and beer columnist, and co-organizer of Baltimore Beer Week); Les White (Free State Homebrewer's Guild President, and co-organizer of Baltimore Beer Week); Jim McGinty (longtime beer wholesaler in Maryland); Erin Tyler (beer wholesaler, co-organizer of Baltimore Beer Week); Paul Pendyck (owner of cask supply house, UK Brewing). One final note. Casey Hard, beer manager at Maxs Taphouse, gave me some interesting news. With 500+ different beer bottles, 2 cask lines, and 75 taps, Max's already is the largest taphouse in Maryland. Not satisfied, the bar is increasing the number of its draft lines to 100, and the cask lines to 6. More about Baltimore Beer Week: here. More about the Real Ale Festival: here. This photo was taken just west of downtown Richmond, Virginia, along the north bank of the James River: an area called Texas Beach. The river is fairly shallow for 30 yards or so off the bank. Waders have created these stone sculptures. That was a warm Sunday afternoon in late September. It's cold weather now. "What's so special about brewing lagers," the passenger asked me, looking over my shoulder at the book I was reading. I was riding the Washington, D.C. subway back from a homebrew supply replenishment expediton to the Maryland suburbs. It was the late 1980s, and that book —Brewing Lager Beer— was a constant companion. What was so special was the breadth of information in that book (since updated and released as New Brewing Lager Beer) applicable to brewing both lagers and ales. Charlie Papazian's book Joy of Homebrewing got me started. Noonan's book got me hooked. The love of making beer even now, when I'm not brewing professionally(1951-2009) has never left. In an important way, Noonan taught me to brew. The book is well-worn. I won't have the opportunity to thank him in person. Greg Noonan died last Saturday. Greg Noonan [1951-2009] moved to the forefront of the craft brewing industry when he lobbied for legalization of brewpubs in Vermont in 1985. The following year, his classic book Brewing Lager Beer quickly became an industry textbook for both home and professional brewers. Noonan opened the Vermont Pub & Brewery in Burlington, Vermont, in 1988, and opened a second brewpub, the Seven Barrel Brewery, in West Lebanon, New Hampshire, in 1994. Noonan released a revised and updated New Brewing Lager Beer and the Seven Barrel Book of Brewing in 1996. Many beer drinkers across the nation will toast Greg tonight at 6pm ET. "Raise a glass to the memory of Greg Noonan; he is one of the original reasons there is craft beer in it." 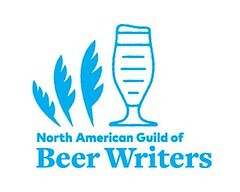 Greg Noonan (1951-2009): craft beer educator and pioneer. Hansen Natural Corporation, parent company to Monster Energy Drink, has sent a cease-and-desist notice to small Vermont brewery Rock Art Brewery. It seems that the multi-million dollar corporation believes that American consumers will be confused between the name of its high-fructose corn syrup 'energy' drink called Monster with a beer called Vermonster, a 10% alcohol by volume "American Barleywine." UPDATE 2009.10.21: It appears as if the issue has been resolved: Vermonster remains. More from beernews.org. An attack has been launched on Matt and Renee of Rock Art Brewery. An energy drink maker has issued a cease and desist order on THE VERMONSTER, brewed by Rock Art Brewery. The energy drink maker claims that consumers will likely be confused with the two products. 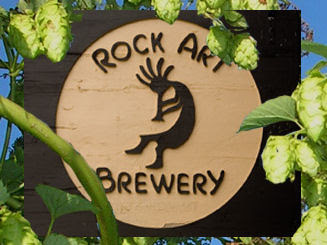 Rock Art Brewery has the beer trademark to the Vermonster in the state of Vermont. Several trademark lawyers have unofficially advised the brewery that this is not an infringement issue, but clearly a nuisance lawsuit. The likelihood is that the brewery will lose, however, because it does not have the financial resources to fund the fight. Large corporations in America are rarely shy about gaming the system to their advantage. But why would a large drinks corporation risk public opprobrium to take on such a small thing as this, showing a tin ear to potential (and now real) public relations problems? There is, obviously, no public confusion as which drink is which, the legal standard that the courts use when deciding such matters. The names aren't really similar. Hansen's action seems to impugn the intelligence of American consumers. Beer is an alcoholic beverage brewed from malted barley, hops (an herb), yeast, and water. methylxanthines (including caffeine), vitamin B and herbs. Other common ingredients are guarana, acai, and taurine, plus various forms of ginseng, maltodextrin, carbonated water, inositol, carnitine, creatine, glucuronolactone and ginkgo biloba. Some contain high levels of sugar, and many brands also offer artificially-sweetened 'diet' versions. The central ingredient in most energy drinks is caffeine. So the question remains: why? Diane Reed, the lawyer who sent the letter, didn't immediately return an e-mail message seeking comment Monday. Ah! Economic times have been tough for the rest of us. Ms. Reed and the legal team at Hansens apparently seem to have been suffering as well. Her bullying action? A billable hours stimulus plan. Not strictly an accurate portrayal. This action is to clear the way for a release of a Monster brand of energy drinks with added alcohol. Monster is made in a plant in North Carolina that also has a brewery in it. They know that the two products don't overlap as they stand, but could potentially cause confusion. As stated, Rock Art Brewery LLC. Is a bonded and federally permitted brewery legally using the name “THE VERMONSTER”. We are not infringing on your client’s trademark. After extensive thought on the issue, considering our rights to our name “THE VERMONSTER” and the unnecessary use of various court resources, I offered to meet your client halfway with a proposal. I offered to give up our rights to our name “THE VERMONSTER” in the energy drink category, as we are two separate markets, one energy drinks, the other alcoholic beverages. This was agreed to be a sensible proposal by various advisors who have classified this issue as one of a nuisance by nature. Your response was that, “the energy drink category was never the concern to my client; it is that my client would now like to enter the alcoholic beverage market.” You indicated that your client would likely proceed with the infringement filings, but you would pass my offer on to them. I await your client’s reasonable and common sense response. There is another beverage called Monster: a 10% alcohol by volume beer brewed by the Brooklyn Brewery, which predates Monster Energy Drink from Hansen, and is sold throughout the US. If Hansen creates an alcoholic Monster, will Brooklyn have the grounds for its own lawsuit? ... to monster Hansen Corporation —as sportscaster Warner Wolf often exclaims— "Boo of the week!" On Twitter, hash-marked with #boycottmonster. A much more reasoned (and researched) post on the situation than mine, from Alan at A Good Beer Blog. Read about trademark confusion between a Georgia brewery and a Virginia brewpub (in the footnote to this blog post). In advance, I'm offering my apologies to the fine writing staff at Mid-Atlantic Brewing News, who have just put out a wonderful issue on the history of craft beer in the Mid-Atlantic region. This historic event at the revered Brickskeller will be a memorable occasion as a panel of 5 respected authoritarians [emphasis mine] on the world of beer will have an open discussion about their lives in beer. Authoritarian: "One who imposes or favors absolute obedience to authority." Was this a reference to Kim Jung Il, Hugo Chavez, Vladimir Putin, Mahmoud Ahmadinejad, and the generals of Burma: all beer lovers? Who knew? Or was this a reference to the beer-stylistas who fiercely decree what a beer can and cannot be? Well, no. What was actually meant was "authorities on the world of beer." The event on 27 October at the Brickskeller in Washington, D.C. does sound as if it could be very interesting. So, thank you MABN, for bringing it to our attention. You've cellared the cask. You've spiled it and brought it into condition. It's ready, and you tap it. The tap malfunctions, and you can't draw any beer. What do you do? 2) Showing no fear, remove the tap. This may require a few soft taps with a mallet side-to-side to jigger the faucet loose. Stand clear! There may be a quick spurt of beer that will quickly end. Think of a finger on a drinking straw filled with liquid. Little flows until the finger releases. It's the same with the hard spile inserted. 3) Insert the new tap with one quick firm tap of the mallet. Remove the hard spile, and voila! Draw some beer. These photos were taken outside at Rustico Restaurant in Alexandria, Virginia, on Saturday, 10 October, for its second annual OktoBEERfest celebration. Caveat lector: As a representative for a northern Virginia beer/wine wholesaler, I sell beers to Rustico, including those from Clipper City Brewing Company. Stay rich, my friend: Heineken and SAB/Miller looking to buy maker of Dos Equis. http://bit.ly/11UTDk. There were nearly 300 folk aboard the USS Constellation, Thursday evening in the Inner Harbor of Baltimore, Maryland. They, and I, were there to celebrate the onset of the first ever Baltimore Beer Week. Past Baltimore Orioles baseball great Boog Powell tapped the ceremonial first cask, using a mallet hand-crafted especially for the event from remnants of Maryland's famous Wye Oak. Raising his arms, he announced "It's tapped, hon! ", and a cannon blast went forth from the ship, reverberating throughout the harbor. Seeing the crowd, seeing faces from Baltimore craft beer present and past, soaking in the atmosphere on a beautiful warm October evening (and having a few beers as well), I felt proud and humbled to have been part of that history. Congratulations to Joe Gold and all the organizers. But most of all, congratulations to all the brewers, brewery owners, beer drinkers, bar owners, bartenders, beer writers, shop owners, distributors, salesmen, volunteers, and all who had the vision, enthusiasm, and skill to create a living, vibrant, good beer culture in Baltimore. At one point, I was asked what I thought. I paused for a few seconds, and came up up with this eloquent summary: "Super cool." Indeed! Read more of my summary of the evening's events in the captions to my photos here. More photos and good stories can be viewed at Sandy Mitchell's blog and at Beer in Baltimore.com. Read earlier, related posts from YFGF here. USS Constellation is the last sail-only warship designed and built by the United States Navy, and is the last existing American Civil War-era naval vessel. October 2009 is the Vegan Month of Food ... or Vegan MoFo. Throughout the month, bloggers will write stories about vegan food, recipes, issues, and lifestyles. Isa Chandra Moskowitz, an author of vegan cookbooks, first introduced the concept in 2007. Here's my mother's recipe for an easy and delicious go-to dish: Cole Slaw (and hold the cream). I used a mandoline. Be VERY careful: it can take off a finger. I chopped the smaller cabbage pieces with a knife. Oil (I used peanut oil for variety). A pinch or two of sugar. Less is better. Use the cabbage outer leaves to line the bowl. Cover, and allow to sit for an hour or so in the refrigerator. The first ever Baltimore Beer Week begins tonight, on the water, literally. Boog Powell *, former Baltimore Oriole who is a longtime friend of beer, will start Baltimore Beer Week with a mighty blow. Powell will crack open a cask of beer aboard the USS Constellation in Baltimore's Inner Harbor . The ceremonial cask tapping is the first of a series of Beer Week events including beer dinners and tastings held at taverns and restaurants around the Baltimore metro area. 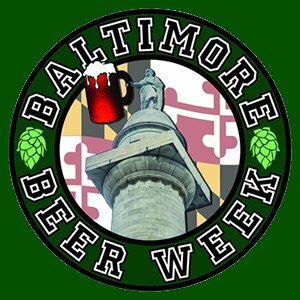 A list of sanctioned events and how to obtain tickets for those requiring them can be found on the events section of the Baltimore Beer Week website www.baltimorebeerweek.com. This ceremonial tapping is a fundraiser to help defray costs of the organizing committee. There will be no walk-up tickets available at the dock **. If you're not to be on-board, consider this opening celebration, instead. It is open to the public. There are 15 (!) other events listed just for this evening. Baltimore Beer Week runs from today through 18 October (an eleven day week: that's Bawlmer beer math, hon! ), featuring more than 350 events ***. Two existing events fall within the celebration as well: the Maryland Brewer's Oktoberfest (10 October, with many brewers and their beers, despite the name) and the Chesapeake Real Ale Festival (17 October). Dominic Cantalupo, a real estate associate broker who as a kid growing up in East Baltimore used to fetch a bucket of beer from the corner tavern for his grandmother <...> Les White, president of the Free State Home Brewer's Guild as well as a computer whiz, and Sandy Mitchell, a reporter for the Mid-Atlantic Brewing News. In 1954, National [Brewing Company] had 60 percent of the Baltimore beer market. The brewery's owner, Jerry Hoffberger, also owned the Baltimore Orioles, an arrangement that a few years year later proved to be felicitous to Boog Powell, who joined the team in 1961. At the start of every homestand, Orioles players would be given a case of National beer, Powell told me. Some of the players did not like beer, so being a good teammate, Powell took it upon himself to relieve them of their unwanted cases. ** The initial opportunity to purchase tickets was afforded to various members of the press and folk associated with Baltimore beer and brewing (both present and past). After that, the invitations were extended via random drawing to anyone who had subscribed to the Baltimore Beer Week newsletter. As space on the USS Constellation is limited, tickets were not made available for general sale to the public. *** I've already heard some carping that many of the events listed are simple beer samplings in Baltimore and Maryland beer shops. To that, I respond, "So, what!" That in no way diminishes the entire celebration or the work involved to organize it, and it ignores the major events around which the festival extends. I'll be going to some of them. For the full listing of events, go here. It may have been a guilty pleasure, but I've been watching weekly episodes of Hells Kitchen, Fox TV's 'reality' cooking program, hosted by celebrity chef Gordon Ramsey. I've been watching because a chef from a local (to me) brewpub has been a contestant. Tennille Middleton is the chef at the Sweetwater Tavern, a brewpub in Falls Church, Virginia. She had survived elimination over 12 episodes. (Read my review of the program here.) But last evening, although it had been a good fun for her, she failed to make the cut. The program's loss is our gain: she remains at Sweetwater. Sweetwater actually lies just outside the Falls Church city limits, in Fairfax County, Virginia, but it shares a Falls Church City zip code. In 2010, Falls Church will be gaining a brewpub (Mad Fox Brewing Company) within its city limits. 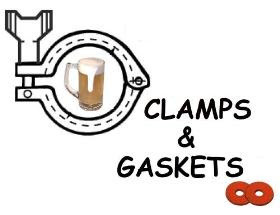 I sometimes assume that readers will understand beer-related jargon that I take for granted. A brewpub is a restaurant that includes a brewery on its premises. Since a brewpub combines the functions of a brewery, a beer distributor, and a beer retailer —three functions that most US states keep separate by law— brewpubs exist as special exemptions to these laws, which are known collectively as the 'three-tier system'. Simply an amazing photograph, but it's not mine. I used a mirror to get the overhead shot. 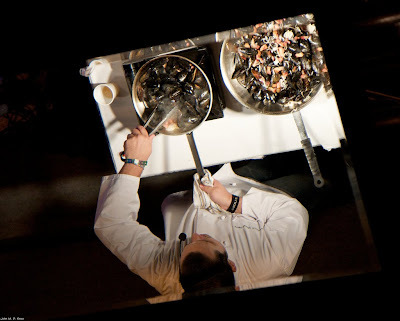 The mirror was hung above the prep table so that a video camera could relay views of the cooking process to a monitor for the audience. I used the same mirror to get the shots I wanted. He adds: "Teddy is a wonderful subject -- he puts on a great show!" See for yourself: Granville Moore's is a Belgian-themed bistro along the newly burgeoning 'scene' of H Street, NE. These mussels, and other variants, are a staple on the menu, along with a large roster of Belgian beers. It's a small and very popular eatery, so, go early in the evening. I'm reminded of something the great baseball player and raconteur Yogi Berra once said about another popular restaurant: "Nobody goes there anymore; it's too crowded." Heat the oil in a pan over high heat. Add in the bacon and cook until the fat is rendered out and the bacon is slightly browned. Add the shallots and mussels and toss together. Add the Hennepin and lemon juice and toss together. When the mussels start to open, add half of the blue cheese, melting it into the broth. When the mussels are fully open, toss in the spinach. Season to taste with sea salt and black pepper. Plate mussels and top with the rest of the blue cheese. Serve with a crusty French baguette ... and a glass of Hennepin, of course! 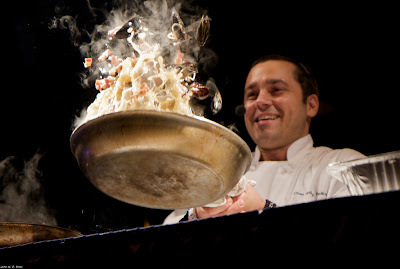 More of John's photos of Chef Folkman here. Jennie Chen wrote about the program at her blog MisoHungry. Hennepin is a saison —a Belgian-inspired wheat ale— brewed by Brewery Ommegang, in upstate New York state. For sheer joie de bière -reminding many of us in the beer business why we began in the first place- my Twitter FollowFriday is @SudsyMaggie. There's a Portland Beer Price Index: http://bit.ly/xiwkm. Why not a beer price index in all metro areas?